"If anyone needs me, I'll be at the Holiday Inn." How many ALCONs have you been to? None...I really don't know what's wrong with me. The year 1998 wasn't actually a high point in Al's career. It had been two years since his bestselling album Bad Hair Day was released, and a follow-up was (at the time) still an indeterminate amount of time away. Al's CBS Saturday morning series The Weird Al Show was ending its one-year run after the network decided to drop its entire lineup. The studio that released his 1989 cult classic UHF had gone bankrupt, making the video unavailable to purchase. The Dr. Demento Show was being dropped by station after station, making Al's presence on the radio smaller and smaller. And Al's only other national television exposure had been a brief appearance at that year's American Music Awards. So what better time was there for fans to throw themselves a party? Through the power of the Internet, that June Al fans Amanda Cohen, Mike Aquilina, and Mike Hoffman were able to plan, organize, and produce an unprecedented one-day convention in suburban Chicago celebrating everything Weird Al. Perhaps on the surface, the idea of a "Weird Al" Yankovic convention might have seemed a little farfetched. After all, conventions are usually more synonymous with comic books, sports, role playing games, and bigger music acts such as the Beatles and Elvis, while Star Trek, Star Wars, and practically every other major faction of science fiction has had its own fan gathering. For there to be a big enough fanbase to produce and actually fill a convention proved that after so many years of being considered by the mainstream to be a sorta second-class performer, Weird Al still had a large, devoted following that wasn't afraid to show its affection. Al shows up unannounced at the end of Bermuda's ALCON video presentation, surprising everyone...even the event organizers! Photo by and courtesy of Amanda Deer. The day was filled with a variety of events, including a costume contest, a trivia game, an auction of actual Al props and costumes, dance lessons, a demented ball, an Al-themed banquet, and performances by some of the up-and-coming artists in the land of demented music, among others (and thankfully there was never any kind of "Trekkie" vibe). Two notable highlights were screenings of both UHF and Al's 1996 Disney Channel special There's No Going Home. 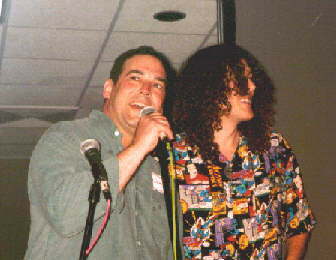 The convention's special guest was Jon "Bermuda" Schwartz, whose online presence had been an integral part of the Al fan community for many years. Jon recounted his career with Al to the audience, fielded questions, and showed numerous rare video clips. Some of the more memorable clips included Al and Jon's first national television appearance on Tom Snyder's The Tomorrow Show in 1981, Al's Diet Coke commercial from 1984, Al performing on stage with the Monkees in 1987, and footage of the Off The Deep End cover shoot, among others. The last video clip was newly shot just for ALCON, as Al addressed the crowd and thanked them for coming to the celebration. He proceeded to tease everyone by holding up a compact disc, indicating that he knew everyone was waiting for this...the new Hanson album! Finally Al apologized for not being able to make it to the convention himself, explaining that he was just really, really busy. As he tried to explain just how busy he was and with what, he started to trail off, not really coming up with anything more descriptive. Finally giving up, Al shrugged, "Oh, who am I kidding? I'm not that busy!" and then walked off-camera. From around the video screen came none other than Al himself! Jon kept this a secret from everyone...not even the folks running the convention knew about it! Heck, Al's manager didn't even know he was going to do this. Al apologized for "crashing" the convention and asked if he could stay for a while. He ended up sticking around for the rest of the day, even helping judge answers for the trivia contest. Al would later explain in interviews that he figured he didn't want to miss out on what might have been the only "Weird Al" Yankovic convention. However, Al had no reason to worry. Two more ALCONs followed, once in 2000 and again in 2002, the latter of which featured Al and Jon's grand return. An unofficial spin-off convention celebrating demented music in general was started, Dr. Demento started touring the country again as a special guest to various sci-fi conventions, and there continues to be talk of another Weird Al-centric convention in the near future. Al fans were able to find their voice in pop culture.